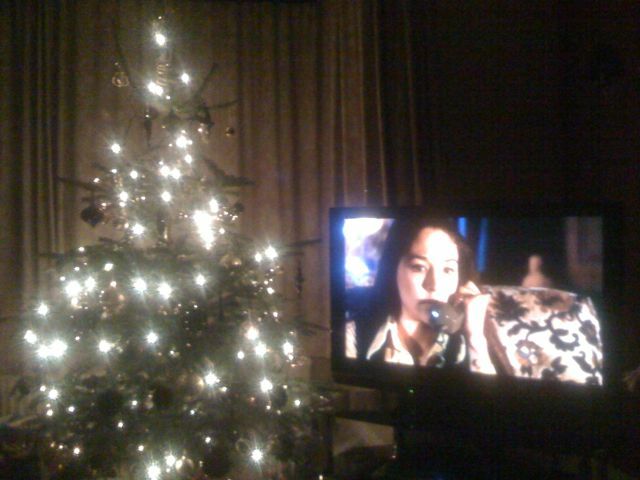 I’m just getting into the Festive Mood by watching my favourite Christmas themed horror movie (the only one that really springs to mind), Black Christmas. I wish all visitors will have a very special time of the year and good wishes for the new one. See you all again soon! I know I said I’d have reviews of these 4 horror films up yesterday, but I forgot about Band Practice and my lack of being able to stay awake during the day! So here’s a brief overlook of the highlights and lowlights! Dance of the Dead: 4/5 – The plot was probably my favourite of the night. But it just came off a little too condensed, it would have been great had it explained why the dead came back to life, rather than just keep on pointing to the Chemical Plant and blaming that (the most it went to explain was when three of the characters ducked out of the carnage into the sewers and saw everything covered in green slime). Tokyo Gore Police: 5/5 – Fabulous look; fabulous sound; classic revenge plot; gore overload; plenty of WTF?! moments. I honestly cannot wait for the sequel and I hope to get my hands on the soundtrack soon. If you liked Battle Royale or Kill Bill Vol. 1, but thought they weren’t gory enough, you will LOVE this. Deadgirl: 2/5 – No light aspect, everyone in it seemed to have no conscience and was constantly horny. The website says “a depraved journey into the psyche of two disaffected teens,” the only problem is we see nothing in the plot as to why these “two” (it’s more like 5) teens got like this. In that area, it left a little too much to the imagination, and in a film like this that’s a bad thing. I feel a bit bad for saying this, cos it’s a great plot, and I’ve seen I got some hits yesterday from people searching for Deadgirl reviews. My Name Is Bruce: 5/5 – Best film overall of the night! Sounded great, used the Psycho theme with a jaunty twist!!! The b-movie plot meets spoof/reality plot should NOT have worked but it did. In the beginning it relied a little too much on slapstick, and took for granted everyone seeing it knew who Bruce Campell (I know who is, but past the first Evil Dead that’s really all I’ve seen of his work), but after about an hour the plot kicked in and I could easily forgive it. Not disappointed to hear that a sequel is in the works, I hope the original gets a wider release. That’s it for my journey into the Leeds Film Festival, but I’ll definitely be back next year!